The new Victoria Park cricket season, now in its thirty first year kicked off on a cloudy chilly evening as the President’s men gathered to take on league champions the Rose & Crown in the traditional opening game of the season. 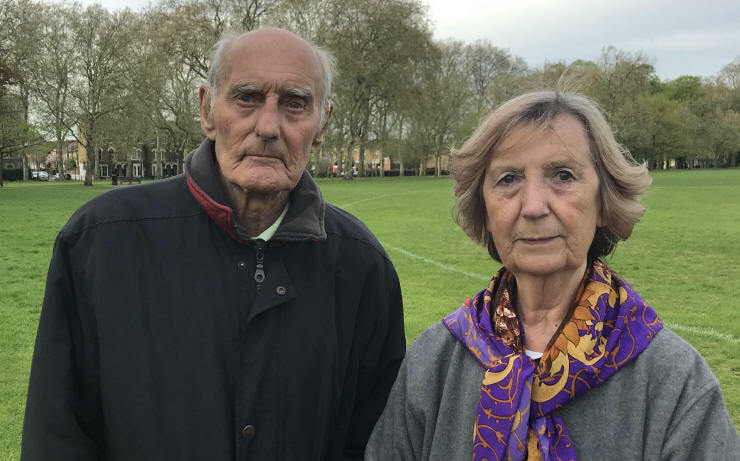 The President’s men were heartened to see the evergreen Bert Vandermark (who has been associated with cricket at Victoria Park for over six decades and the league for 29 of its 30 years, life president and the first lady Rita, join them on this auspicious occasion. 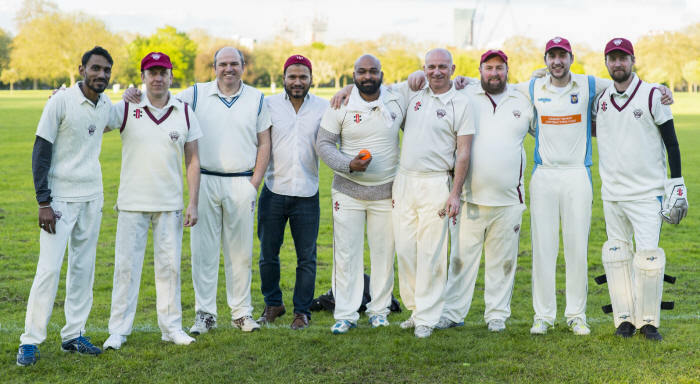 Rizwan Siddiqui, captain of the President's VIII won the toss and elected to field, and with Tom Hughes of London Fields anchoring the innings with a run a ball 50, the score reached 102 in the 14th over. It was at this juncture that Salman of London Tigers and Rizwan got to the crease and hammered the champions all over the park to score 46 runs in 12 balls and end on 149-4 off the allotted 16 overs. Rose and Crown in reply were shackled early on by tight bowling from Salman and Altaf (Friends CC) but the big hitting No 3 soon upped the ante, taking a particular liking to Farhad (OFCC) and Saj Rehman’s (Best Nationals) wrist spin. With 9 needed off the last over and 3 off the last ball, the ball was hit to deep point for two and there ended the contest...in a tie. A just result for a game played in excellent spirit and a fitting way to start the 2018 season. Following on from last year, the season is split into stages: Six initial qualifying groups of four filtering through to two divisions for the main part of the season. In a new twist to this years season, the Old Fallopians, one of the original teams in the league were allowed to enter a second VIII. Their first team won their opening match against Mad Marrocas with relative ease. Chasing just 96 after Mad Marrocas were bowled out for 95 in 14 overs. Old Fallopians chased down their target with thirteen balls to spare. Their second eleven team suffered an eighty run defat to last season;s joint runners up Sky. In a match reduced to 14 overs per side, Sky, batting first coastd to a huge 156-3, in reply Old Fallopians could only manage 76-5. The other runner up from last season, Friends (formerly Technosys), roared to a superb opening victory against Sports Interactive. Their opening three batsmen, Sanga, Miah and Afzal all retired on 50 as Friends struck a huge 212 off their 16 overs. Despite a spirited 37 from Buck, Sports Interactive fell well short of their target finishing on 112-6. Mile Tailenders stormed past Crossrail. Despite a strong 34 from skipper Venn, chasing 122, Mile Tailenders eased to victory hunting down their target with still thirteen balls remaining, keeper Gunewardene retiring on 50. Regents earned a narrow victory over Camel Lights. Despite losing early wickets and falling to 36-3, Regents finished on 120-3 with a super partnership between Dinesen (36) and Salmonsmith (46 off only 26 balls). Camel Lights kept up with the run rate but not quite enough as they eventually finished on 113-3, just seven runs short of their target. New entrants to the league L&Q Living opened with a defeat to Millwall. The league debutants were bowled out for just 95 with two balls remaining. Millwall eased to victory in just over ten overs thanks to a super half century from captain and wicket keeper A. Ahmed who hit seven fours, this after Millwall lost an early wicket as both openers were caught and bowled.